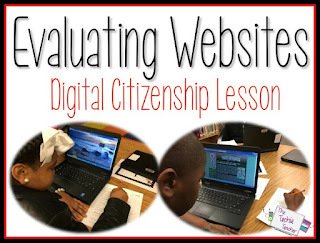 Evaluating Websites | The Techie Teacher® . Yesterday 5th graders at one of my elementary schools took part in a Digital Citizenship Day to complete the Internet Safety modules that all teachers in our county have to complete this year. Each teacher was responsible for teaching one of the modules and students circulated around to each classroom. The librarian, Suzanne Stockman, and I co-taught the 5th grade module on website evaluation. Suzanne found this awesome SlideShare presentation that talks about the 5 Ws of evaluating websites. At the end of the activity Mrs. Stockman and I revealed which websites were real and which ones were fake. The students had a ball and left the library giggling away! Hi! I'm trying to access the folder of web addresses, but none of them do anything or go anywhere for me! Help!